Together with my colleagues Thomas Picht (Charité Universitätsmedizin), Kathrin Friedrich (Universität Potsdam), Matthias Bruhn (HfG Karlsruhe), Kirsten Ostherr (Rice University), Rebekka Lauer and Anna Roethe (Humboldt Universität) I developed an interdisciplinary teaching module on medical imaging at Charité University Hospital. My part of the course focuses on experimental imaging technology in medical practice with a particular focus on virtual and augmented reality applications as well as on 3D simulation in surgical practice. 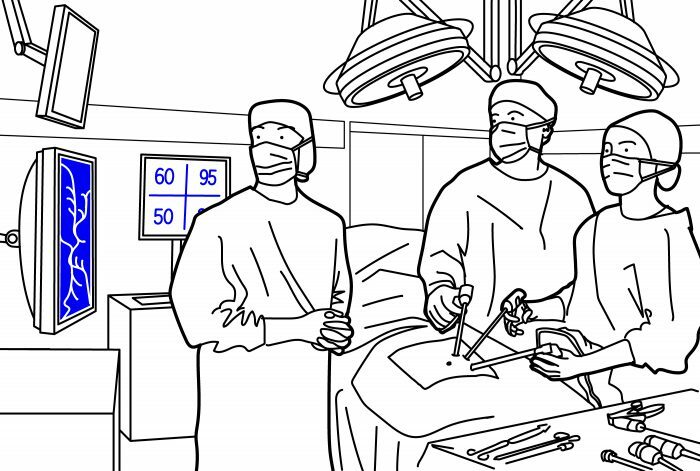 Course outline: The first, general, objective of the module is to sensitize students to the extraordinary significance of the ‚image‘ in modern medicine and particularly in surgery. Images serve as an imperative impetus to action within the routine of clinical medicine. The second general objective of the module is to empower future doctors to apply medical imaging in the best interest of their patient. The ability to critically analyze images is a pre-condition for this. Three topics will help to impart this knowledge: first, comparative analysis of the media in question and the associated technical procedures and modalities of representation; second, a historical classification of the aforementioned media and procedures, etc. ; and third, an overview of places and times at which images become effective tools. This will enable an understanding of the mechanisms that have implicated images in a range of processes. The third objective underpinning the module, alongside the fundamental teaching of image analysis, is the mediation of current technical developments in the field of medical imaging – something which must be a continually updated. The focus here is on the increasing synchronization of image and body in 3D; augmented and virtual reality applications; and the progressive distancing of staff and patient in the areas of pre-planning, remote control and robotics. Students will be expected to acquire the necessary professionalism when working with images so that, both now and in the future, they can make best use of medical imaging opportunities. Theories referred to in the training blocks will be set alongside corresponding clinical case studies as part of the interactive discussion of cases. Supervised patient examinations, patient-side teaching and OR work shadowing will also be offered in relevant areas. Download Im Bildlabor der Neurochirurgie (CC BY-NC-ND 3.0 DE). Citation: Kathrin Friedrich, Thomas Picht, Moritz Queisner, Anna Roethe (2015) Im Bildlabor der Neurochirurgie. Ein interdisziplinärer, bildgeführter Fallbericht. In: Wolfgang Schäffner / Horst Bredekamp (Hrg. ): Haare hören – Strukturen wissen – Räume agieren. Transcript. S.31–43.